Graaff-Reinet is often referred to the heart of the “Great Karoo,” and quite aptly so. Flanked by the Camdeboo National Park in South Africa’s Eastern Cape, Graaff-Reinet continues to draw thousands of visitors from all walks of life throughout the year. One of the oldest towns in South Africa, its history dates back to 1786, and many of its original buildings have been preserved and declared national monuments. The picturesque Sneeuberg mountain range keeps a watchful eye over this rural Eastern Cape town, which nestles in the horseshoe bend of the Sundays River. Graaff-Reinet also boasts more buildings that have been proclaimed national monuments than other other town in the country. It is just one of the many reasons why you will want to pack your bags and book self-catering accommodation in this world-famous Karoo town. Make Graaff-Reinet your base for exploring the entire region, and retreat to a comfortable self-catering unit after a long day of exploration and adventure. There are so many fun and exciting activities to keep you thoroughly entertained during your stopover in Graaff-Reinet, that you will be spoilt for choice. In fact, you will have a hard time fitting in all the activities in just one visit, and might have to book your stay at our self-catering guest house for your next trip upon checking out. One of the most popular attractions responsible for drawing people to the region is the 15 000-hectare Karoo National Reserve. It is here where the Valley of Desolation lies, keeping track of silent memories of thousands of years gone by. The past is meticulously preserved in four extraordinary museums, holding collections of firearms, artworks, photographic memorabilia, and fossils, as they trace the story of the Karoo. Our beautifully restored home, with its seven self-catering units, lies in the heart of Graaff-Reinet. We welcome visitors from across South Africa and abroad to our luxuriously appointed accommodation, and make their stay truly memorable. Whether you are passing through or lingering for a while, we offer a place to rest and rejuvenate your weary soul in affordable luxury. The town is surrounded by nature on all sides, which only further adds to the tranquillity and peace that one would expect from a Karoo town. You will also find charming shops, award-winning restaurants, and everything in between. Let us help you make your stay as enjoyable and comfortable as possible. Each unit also features top-quality linen and bedding, with modern kitchenette appliances to help you prepare all your own meals, should you wish. We also keep you connected with DStv, and the beautiful wooden floors add another touch of class. If you would like more information on our luxurious self-catering accommodation in Graaff-Reinet, and to book your stay without delay, contact our reservationists today. Secure your booking well in advance to avoid disappointment. We look forward to welcome you to our small piece of Karoo heaven, and to make your stay memorable for all the right reasons. Just because you are passing through, does not mean you need to settle for less. We will make your overnight stay in Graaff-Reinet one to remember, even if it is just for a few hours. Our beautiful historic town is popular with tourists passing through, or those making the trek between Johannesburg and Cape Town. This means we welcome a diverse group of travellers from all walks of life, and all nationalities, to our luxurious overnight self-catering accommodation. We are excited to welcome you and your family, and are sure you will enjoy your overnight stay at our welcoming accommodation. However, if you want to stick around a while before leaving, you will find South Africa’s fourth-oldest town to be filled to the brim with fascinating gems like museums and award-winning restaurants. What more do you need for a truly authentic Karoo experience? As the fourth oldest town in South Africa, Graaff-Reinet is home to some of the most magnificent examples of Cape Dutch architecture to be found anywhere in the country. What is more, there are over 220 heritage sites and national monuments – more than any other town in the entire South Africa. Will you be able to visit each one on your visit to Graaff-Reinet? Who knows, but we will make sure you have a comfortable home to come back to each night after a long day of adventures and exploration. For the nature lover, it is also worthwhile taking a drive to the incredible Valley of Desolation in the Camdeboo National Park. Here, you can try to spot any of the exciting game that call the 14 000-hectare reserve their home. Be on the lookout for mountain zebra, springbok, gemsbok, and wildebeest, to name only a few examples of the abundant wildlife. 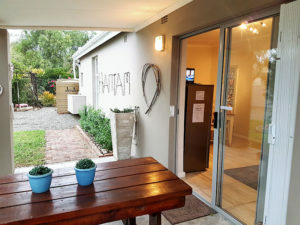 What Can You Expect from Our Overnight Self-Catering Accommodation in Graaff-Reinet? Of course, if you have any questions, you are welcome to contact us to discuss them. Our reservationists are ready to help you book and secure your overnight self-catering accommodation while travelling through Graaff-Reinet. Book your stay early to avoid disappointment, and look forward to a fantastic time in a richly historical part of South Africa. We look forward to welcoming you, and will endeavour to make your stay as comfortable and enjoyable as possible.